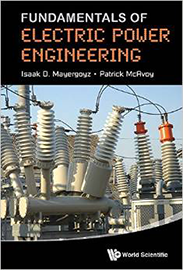 Professor Isaak Mayergoyz and Patrick McAvoy co-authored this unique text on electric power engineering. ECE Professor Isaak Mayergoyz and his research associate Patrick McAvoy authored "Fundamentals in Electric Power Engineering" which is published by World Scientific. This text presents a concise and rigorous exposition of the main fundamentals of electric power engineering. Electric power engineering has always been an integral part of electrical engineering education. Unique from other texts on the market, the materials contained in this single volume can be used to teach three separate courses — electrical machines, power systems and power electronics, which are in mainstream electrical engineering curriculum at most universities worldwide. The book also highlights an in-depth review of electric and magnetic circuit theory with emphasis on the topics which are most relevant to electric power engineering. The text has a strong theoretical focus emphasizing the physical and mathematical aspects of electric power engineering fundaments which clearly reveals the multidisciplinary nature of power engineering and its connections with other areas in electrical engineering. The authors strove to produce a student-friendly textbook. They feel a student’s interests are best served when complicated concepts are not avoided, but discussed in a straightforward way. Professor Mayergoyz became a full professor of the Electrical and Computer Engineering Department of University of Maryland, College Park in 1980. In cooperation with Prof. Fawzi Emad, he established the electric power engineering curriculum and educational program in the ECE Department and has maintained it for more than 30 years. For many years, he served as a consultant for the Research and Development Center of General Electric Company and has been selected as a visiting research fellow of this center. He has authored and coauthored 12 books and over 400 scientific papers. He is a Fellow of IEEE (1988), Visiting Research Fellow of GE Research and Development Center (1988), Distinguished Lecturer of the IEEE Magnetics Society (1994), Distinguished Scholar-Teacher of University of Maryland, College Park (1994) and a recipient of Outstanding Teacher Award of College of Engineering (1987). In 2009, he received the Achievement Award of the Institute of Electrical and Electronics Engineers (IEEE) Magnetics Society, the highest award given by the society. He has served on numerous IEEE committees, editorial boards of scientific journals and as the Editor of Academic Press-Elsevier Electromagnetism series. Patrick McAvoy received his Ph.D. from the University of Maryland in 2008. He was advised by Professor Mayergoyz and has worked as research associate on Professor Mayergoyz’s team since 2010. He has taught the undergraduate Electrical Machines laboratory course and has interests in electromagnetics and electric power engineering.
" The materials contained in this single volume can be used to teach three separate courses — electrical machines, power systems and power electronics, which are in mainstream electrical engineering curriculum at most universities worldwide."